The marchers on Brickdam. Among those at the front are veteran trade unionist Lincoln Lewis and Minister of Social Protection with responsibility for labour, Volda Lawrence. United for the first time in decades, trade union leaders yesterday blasted the David Granger administration for its failure to keep several promises but Prime Minister Moses Nagamootoo said that work is being done even as he urged that the criticism of government be fair. 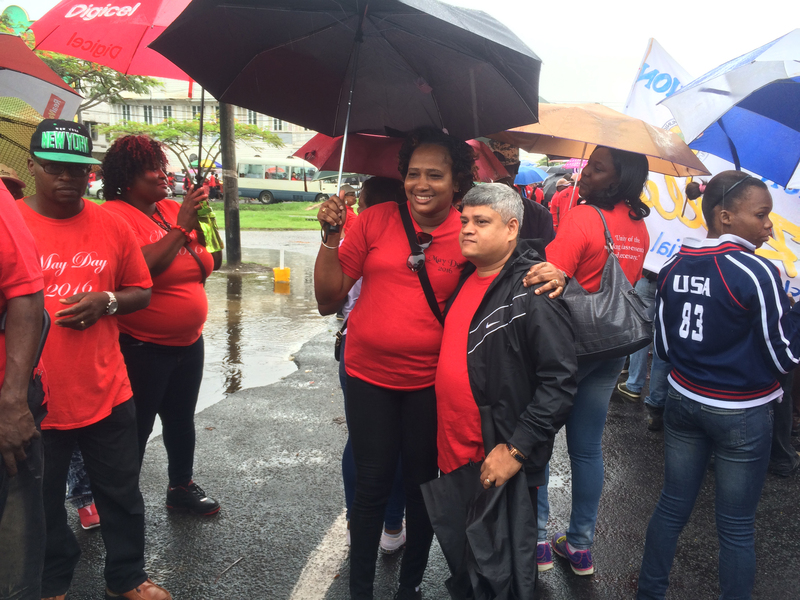 Ministers in the Ministry of Finance and Public Infrastructure, Jaipaul Sharma and Annette Ferguson sharing an umbrella at yesterday’s rain-soaked May Day. Participating in a joint May Day rally for the first time since 1988, the trade union leaders fired at the administration from all sides on a string of issues with Guyana Trades Union Congress (GTUC) General Secretary Lincoln Lewis warning that “efforts are intensifying at treating us with contempt and wanting to put us on the fringe of society.” In an extraordinary May Day scene, speaker after speaker berated the government on issues ranging from the absence of collective bargaining to crime to the closure of two sugar estates. They called for government to engage the labour movement and reverse course on some issues. The older union leaders did not escape unscathed as younger representatives accused them of denying women and youths, leadership positions in the various bodies. While the union leaders were united in calling out government for not acting on the issues affecting workers, it was clear that the unity among the rank and file remains fragile as boos greeted some speakers including PPP General Secretary Clement Rohee, who was heckled throughout his speech. Even Lewis himself, a veteran trade unionist, was not immune as he came under attack from apparent government supporters who heckled and derided him as “Lincoln Jagdeo” even as he pointed out that he fought for workers’ rights under the previous administration and vowed to hold the present one accountable. 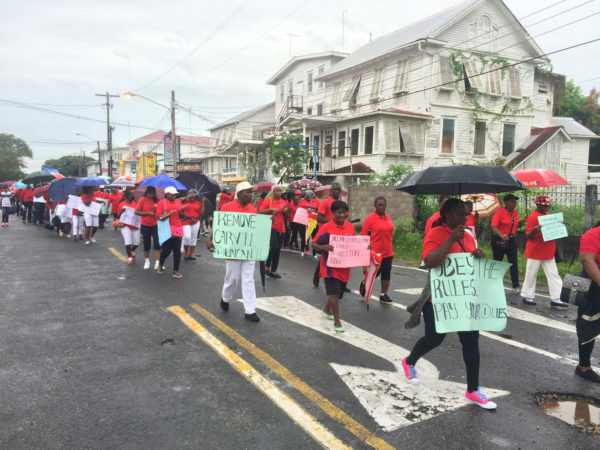 Prior to the rally at the National Park, the various unions that fall under the umbrellas of the GTUC and the Federation of Independent Trade Unions of Guyana (FITUG) marched under cloudy skies through the streets of Georgetown. Over the years, following a split in the local trade union movement, the unions affiliated to the GTUC and FITUG have marched together but have held separate rallies. The fracture occurred in 1988 in the wake of the PNC administration’s Economic Recovery Programme when seven unions opposed to the administration’s policies and the GTUC’s apparent support for them, formed FITUG. The unions affiliated to the GTUC were seen as pro-PNC while those affiliated to FITUG were seen as pro-PPP. Yesterday’s show of unity was not lost on the various speakers who hailed the “watershed” moment and expressed hope that together “we today can change the course of history in this country.” Among the speakers at the rally were Lewis, Nagamootoo, Rohee, Guyana Teachers Union (GTU) General Secretary Coretta McDonald, GTUC President Leslie Gonsalves, President of the Guyana Agricultural and General Workers Union (GAWU) Komal Chand, General Secretary of FITUG Kenneth Joseph, Guyana Public Service Union (GPSU) Vice President Mortimer Livan, and women’s and youth’s representatives. GTUC Vice President Norris Witter chaired the proceedings which lasted for over three hours. The various speakers were united in highlighting not only the issues affecting their unions but issues that extended across the trade union movement. Among the two main issues were collective bargaining and the future of the sugar industry while crime also took centre stage. 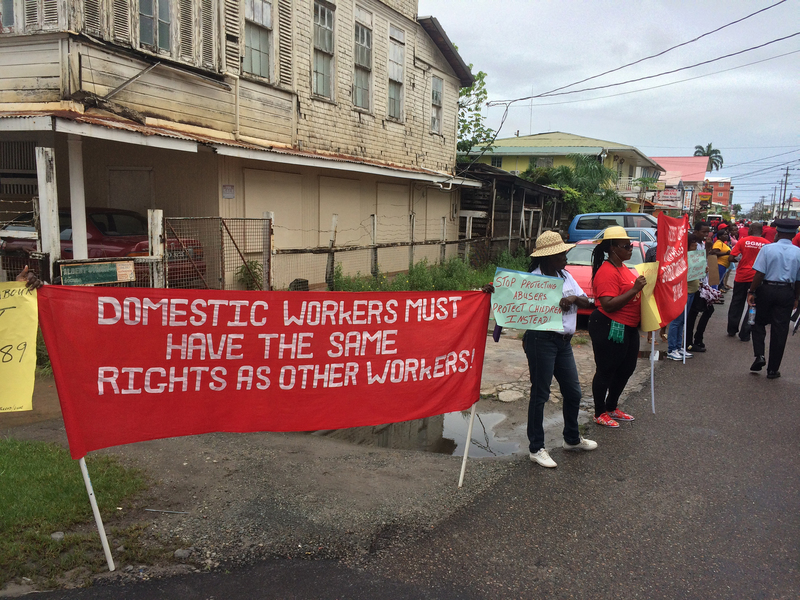 Red Thread mounted a protest along the marchers’s route over domestic violence. Lewis called on government to commence negotiations for wages and salaries with the GPSU saying that it has nothing to do with the work of the Public Service Commission of Inquiry (COI) which the government has said it is awaiting before talks commence. Lewis charged that this breaches Section 23 (1) of the Trade Union Recognition Act and which says once a Recognition Agreement exists, the employer has to treat with the union in good faith. He also pointed out that the right to collective bargaining is protected in Article 147 of the Constitution. “There is nothing including a commission, that legally supersedes this law. This administration is called upon to engage in wages and salaries negotiation with the GPSU…it is time to bring an end to the more than a decade contempt for the law and workers’ rights by government as the employer,” he declared. Others also called for collective bargaining including Chand who said this process was denied to GAWU last year. The government’s promise of collective bargaining with unions in the public service after almost one year has not been fulfilled, he said. In response, Nagamootoo defended the government saying that it has been working and it has sought to address the immediate concerns of workers. According to him, collective bargaining had been “slaughtered” in Guyana some 20 years ago. 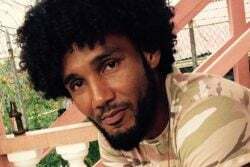 “And we hear here this recitation of collective bargaining, collective bargaining, collective bargaining even from those who presided over the funeral rites of collective bargaining,” he said in an apparent reference to Rohee who had also called for collective bargaining. Nagamootoo, who had been a longstanding member of the PPP until he joined the Alliance for Change for the 2011 general elections, pointed to the promises made in the APNU+AFC’s manifesto and listed what has been accomplished including the restoration of the check-off for automatic deduction of union dues, ensuring that Guyanese are employed at all projects and the provision of subventions to all legally constituted and functioning trade unions. He also highlighted the restoration of the subvention to the Critchlow Labour College and government’s move to reform the public service. “And therefore I will not discredit the commission that is called the Lutchman commission that is trying to complete the stratification and adjustment to the public service with regards to wages. All I can say is this, that after that report is received that we will, we will in fact, we shall be dealing with the labour unions,” he asserted. The Prime Minister declared that government is committed to paying salary increases this year after the submission of the COI report. “Instead of one-off we’d wish a long range arrangement that goes beyond wages and salaries” to involve housing, land, health and recreation, among others, he added. “Much has been said as if this government which is a partner with labour has been sitting on its hands in these last 12 months but I want to let you know that the contours of this new arrangement I talk about has been emerging,” Nagamootoo declared. He pointed to the “modest” wage increase as well as the “sincere attempt” to give government workers a top-up of $5000. He said the administration has attempted to address the immediate concerns of workers pointing to the increases in the minimum wage and income tax threshold, the increase in zero-rated items, the pensions increase as well as the decrease in gas prices and electricity tariffs. While public servants got a small wage hike, the Granger administration was severely criticised after Cabinet ministers were awarded a 50% salary increase. Nagamootoo said in 2016, government has set aside $43.8 billion for wages and salaries with an additional $6 billion for benefits and allowances. “The allocation is in the budget, the question is whether you will observe industrial practice and best practice in relation to negotiations…and allow the process to take its course,” he declared. Meantime, Chand said they are peeved that sugar industry workers are being treated in a disdainful manner. “It is lamentable that for the first time in over three decades, the thousands of workers did not obtain a wage adjustment. GuySuCo bluntly refused to discuss pay rise for 2015. Such refusal to engage in collective bargaining speaks volumes and of course is a violation of laws, international conventions, and our agreements,” he said while urging that it be halted before it spreads. The GAWU head also highlighted the plight of persons linked to the Wales Sugar Estate who have the threat of joblessness and greater hardships hanging over their heads. “The closure decision is a step in the wrong direction especially in the absence of any impact assessment and in view of the Sugar COI’s explicit recommendation that no estate be closed,” he argued. He urged the relevant authorities to act wisely and not close the Wales estate. “GAWU also urges that a similar assessment be done with respect to the present operations at LBI Estate where the consequences of closure for the workers are also great,” he said. “We believe the challenges the industry faces are not insurmountable. Sugar’s success will redound to the benefit of our economy and assure the employment of thousands of Guyanese. A key factor for success is GuySuCo’s ability to grow a sufficient quantity of good-quality canes. We have adequate land for that. And, given today’s trends, with good management, a satisfied labour force and innovations, the industry can certainly regain its profitable status in a short while,” he asserted. 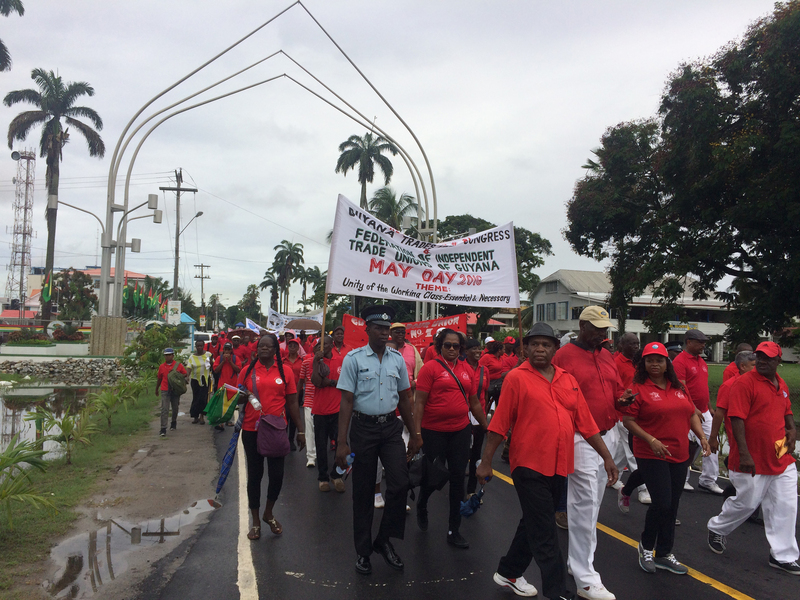 Lewis urged more engagement and recalled that the GTUC had recommended that a mechanism be put in place to involve the sugar industry unions and other stakeholders the closure will impact on. He highlighted Agriculture Minister Noel Holder’s lack of engagement. “Since the government is talking about social inclusion, national unity and inclusionary democracy, Wales provides the ideal opportunity to effectively commence dialogue and engagement to realise what the government says it wants for the society,” he said. The trade union head also said the GTUC was taken aback by the administration’s response to the sugar unions’ questions about the closure of LBI. “To respond that the process of closure started under the Bharrat Jagdeo administration when that administration is known for its mismanagement of the industry and the attendant problems suffered today, this government should have known better than to hide behind the decision made by a man whose record on the industry is disastrous,” he declared. As he spoke, Lewis was booed by a small but vocal section of the crowd. “Lincoln Jagdeo,” one heckled. Earlier, the rally had approved a motion that called on the government and GuySuCo to abandon their decisions to close the Wales and LBI operations and not to privatize part or all of the sugar industry. The motion also called on government to provide adequate financial support to enable the industry to overcome its challenges at this time. It also mandated the GTUC and FITUG to engage with government and stakeholders on matters relative to the turnaround. Crime was also highlighted as a matter of major concern by several speakers including Chand and Rohee. “Clearly we are experiencing yet another spike in criminal activities. The violent dimensions and frequency of occurrences have raised concerns and anger at every level of society. We of FITUG believe the situation is very serious. We need assuring results and the relevant authorities need to regularly review their tactics to contain, reduce and eventually stamp out this menace from our midst,” Chand declared. Lewis was forthright in articulating a number of issues of concern and warned of “those who are engaging in conduct tantamount to that of the colonial authority.” He said that labour expects APNU+AFC as well as the PPP to honour the promises made in their manifestos and urged them to find commonalities in their manifestos to work together, move the country forward and serve the people who have elected them. He chided government on a number of matters including the failure to honour an agreement made with the GTU by the previous administration. He charged that members of government have told teachers’ representatives that the agreement with the PPP/C administration was a “campaign ploy” and the APNU+AFC administration is not obligated to honour it. “Let me put these officials on notice. Once an agreement exists with a government or any institution and though the actors may change, that agreement stands,’ he declared. He highlighted the issue of low wages. “Given that the politicians paid themselves astronomical increases under the pretext that this will minimize corruption on their part, so too must our men and women in uniform be paid. The public sector workers, teachers and military must demand that the same barometer must be used to determine salary increases for the politicians be used for them. If this government wants a corruption-free public service, teaching service and military service, as they pay themselves to avoid being corrupt, they must pay workers likewise so they too will avoid being corrupted,” he declared. Lewis also highlighted the state of the economy and said there seems to be an absence of a coherent national development policy though there have been pronouncements on a green economy. “…the green economy does not mean making the environment green, wearing things green and painting things in green,” he declared. As he spoke, Lewis was continuously heckled but also received shouts of support. “I will not be silenced,” he vowed. He was the only speaker identified by name by Nagamootoo. “When I hear my good brother and friend Lincoln Lewis speaking, I knew he had been doing that speech for the past 20 years,” the Prime Minister said while adding that Lewis has found everything under the sun for which he could criticise and indict the 11-month old administration. “We must be fair in how we criticize. We have a responsibility to have free speech and to say things we want to say freely but we have a duty to say these things responsibly and to say it in the interest of the working people,” he said. He highlighted the state of the country inherited by the APNU+AFC administration and said this must be used in assessing how the country progresses. “We have much to be thankful for,” Nagamootoo proclaimed even as he called for unity and healing. “We can be great again,” he declared.